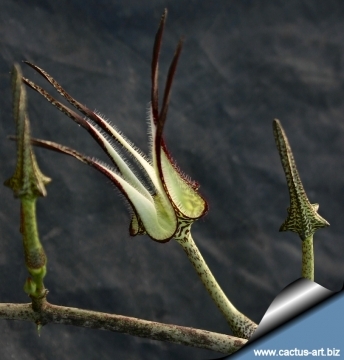 Habitat: Ceropegia stapeliiformis is usually found rooted in leaf mould under the protection of shrubs. The vegetative parts of the plant are very well camouflaged in their habitat, and the plants are quite difficult to spot, even when flowering. 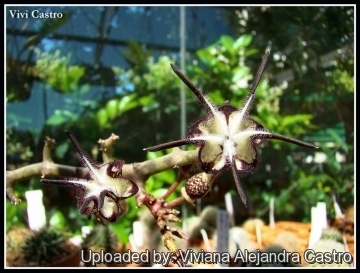 Description: Ceropegia stapeliiformis is a most curious flowering plant with stems very much resemblimg those of a Stapelia but they grow much longer. 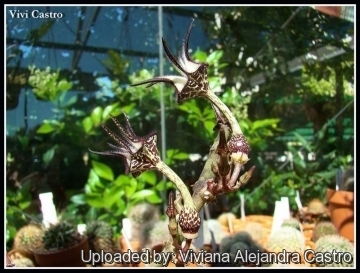 The flowers are very singular with the corolla cut into five segments free-spreading, reflexed and fringed with hairs. Habit: It is a low growing succulent species creeping, scrambling or occasionally twining. It has either climbing stems, thin and more than one metre long, especially in the case of plants grown in a warm and moist atmosphere (green-houses), or short, gnarled stems, about 20 cm long, creeping on the surface or burrowing into the ground. Stem: 1-1,8 cm thick near the base, tapering toward the tip, up to 1,5 m long, very succulent, full of a clear milky juice, rounded, glabrous, of a dark lurid green colour, often striped or blotched with red-brown, slightly glossy, glabrous, marked with with prominent tubercles. The creeping stems can take root, leaving older parts behind to wither and die. Leaves: Rudimentary and ephemeral at the growing tips only, represented by minute triangular to cordate scales with robust milky-cloudy stipular glands. Roots: Fibrous which develop adventitiously where the stems touch the ground. Flowers: One to two (occasionally more), 5-7(-10) cm long and scarcely twining from the thin tapering ends of the shoots. Peduncle (2-)4-6(-20) mm long, thickened upwards. Pedicels 6-10 mm long; Sepals lanceolate 4 mm long. Corolla about 5-7 cm long with an ovoid base 6-7 mm wide and cut into five thin lobes. Lobes broadly triangular at the base the thin, 2-4 cm long, free, not attached at the tips, dark purple or brownish outside white and hairy within, curve backwards and the sides reflexed so that the upper side having the form of a sharp keel presenting a most singular appearance .Tube funnel-shaped, ± 3 mm in diameter, curved, swelling below, and constricted just above the base, greenish white much dappled with dull purple . Staminal crown with the exterior lobes short, erect, or slightly patent, emarginate, inner elongated, erecto-connivent, filiform.The buds have an interesting structure greatly resembling slender lanterns. Blooming season: Spring to early summer. The fragile blooms last for several days on the plant. 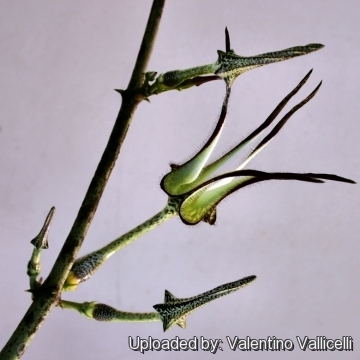 It blooms when the vine reaches about 60 cm in length. Fruits: Typical twin seed horns (follicles), grey-green, erect, broadly fusiform, about 10 cm long with tubercles. 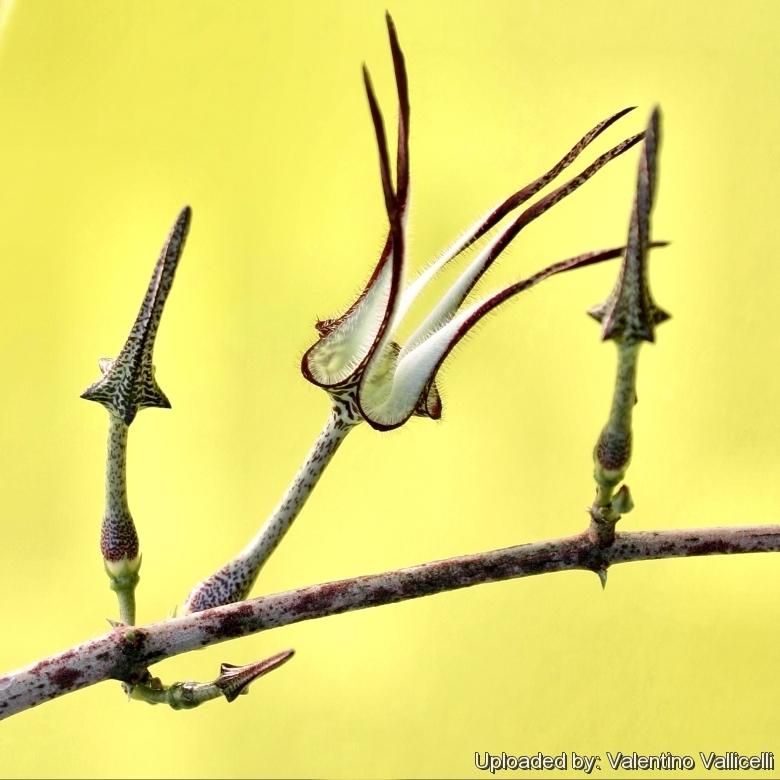 Ceropegia stapeliiformis Haw. : the petals curve backwards so that the upper side having the form of a sharp keel presenting a most singular appearance. Distribution: Uitenhage and Willowmore to Graaff Reinet and King William's Town (only S of 31° S). 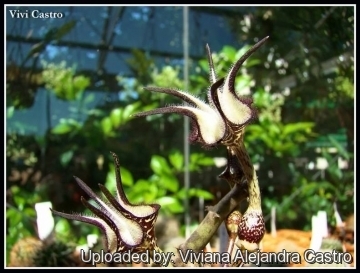 Ceropegia stapeliiformis subs. serpentina (E.A.Bruce) R.A.Dyer: the petals are not that straddled and are somewhat screwed. Distributiom: Northern KwaZulu-Natal and Swaziland to Gauteng, Mpumalanga and Limpopo provinces of South Africa (only N of 28° S). 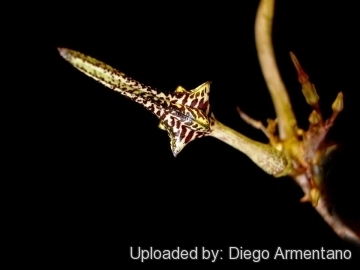 4) Dyer “Ceropegia, Brachystelma & Riocreuxia in Southern Africa” A.A. Balkema, Rotterdam. 1983. 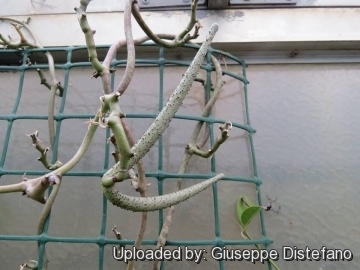 Cultivation and Propagation: Ceropegia stapeliiformis is a xerophytic plant adapted to dry soils, that can be grown in greenhouses with other succulents, but it can also be grown on window-sills. It is reputed quite difficult to grow, and it can be quite frustrating for the 'beginner'. If one waters too sparingly, the brown sticks shrivel. A tiny bit more water results in rot despite having the plant in very well draining soil and growing it in full sun. During the growing period it requires heat, light and adequate watering. Sometime a plant that formerly grew very well, suddenly dies off. But in fact this 'dying' is a quite normal part of the life cycle in this species. However the flowers are most interesting and worth the trouble, only bearing in mind that this species benefits from slightly warmer winter than others. Frost Tolerance: For safe cultivation it is best to avoid freezing temperatures (minimum 5° C). In the rest period no high atmospheric humidity!! Growing practices: The pencil- like stem grows over a meter long and racks or other long cane-like structures are needed to climb up. Sun Exposure: Best for half-shade but grow well in full sun and shade too. Tends to bronze in strong light, which encourages flowering, but is likely to suffer from sun scorch or stunted growth if over exposed to direct sunlight during the hottest part of the day in summer. Diseases: This species is relatively resistant to cryptogamic diseases than others and is quite resistant to the “Balck spot” disease of Asclepiads. 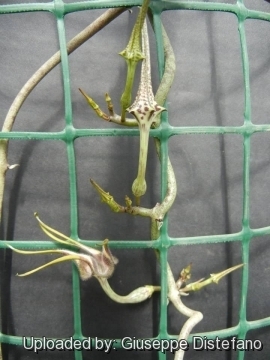 Rot it is only a minor problem with Ceropegia stapeliiformis if the plants are watered and “aired” correctly. If they are not, fungicides won't help all that much. Uses: It is an excellent plant for container growing. Cascading, clustering, great for a hanging display. Propagation: Seeds and cuttings. The downwards growing stick-like mottled branches root easily in regular well drained Cactus mix. Cuttings will root only in hot weather. Cuttings must be kept very dry to root. Seeds germinate readily if they are sown when fresh.